See page for author [Public domain], via Wikimedia Commons. Not actually the Justitia, but the Discovery Prison Hulk also at Woolwich around about the same period. I'm using my free 14 day trial at Ancestry.co.uk, to see if I can pick up any new details for the family history. Whenever I see an ancestor suddenly disappear out of the records from his wife and children, I tend to think either desertion or death. But this is not always the case. Sometimes there is another reason. That is the lesson of today's story. Back in the pre-Internet days when I carried out much of my genealogical research, I came across a bit of a puzzle on my grandmother Doris Brooker's (nee Smith) side of the family. According to a marriage register and a 19th Century census, my great great grandmother Ann Smith was born circa 1835 in Lincolnshire, as Ann Peach. That was as far as I got back in the days of traditional paper based genealogy. In recent months, with my return to Genealogy within the Age of the Internet, I made a break through. She was actually born 27th July 1835 at Etton, near to Peterborough, to a David and Sarah Peach. Her mother Sarah, had been born as Sarah Riches at Hockham back in Norfolk. Later, Sarah returned to Norfolk without David. She and her daughter Ann appeared as servants in Attleborough, Norfolk, where young Ann met my great great grandfather Robert Smith. Sarah worked in Attleborough as a char lady or washer woman for many years after. She never appeared to marry again, but did go on to give birth to a few more children, that went on to carry the Peach surname. So where did her husband David Peach go? They were actually married four months before the birth of Ann, at Holywell in Lincolnshire. How Sarah ended up there remains a mystery. Few of my ancestors moved as far at that time. I have not so far been able to trace his roots. I was trying to do so, when I just browsed on the records at Ancestry.co.uk, that answered the question, where did my great great great grandfather David Peach go to? The sources of the answer? The UK, Prison Hulk Registers and Letter Books 1802-1849, and England & Wales, Criminal Registers 1791-1892. David Peach had been convicted of cattle stealing in an assize court, on the 15th July 1837. He was found guilty. His punishment for the crime was Life Transportation. In this case, it appears that he was first sent to serve as a prisoner, on a prison hulk ship, moored at Woolwich, London. The ship that was to serve as his temporary prison, was the Justitia. The prison hulk registers of the Justitia, record that he was 30 years old, was married, had stolen two steers, was literate, and was a shepherd by trade. He had been incarcerated on the 27th September 1837, shortly after his trial in Lincoln. 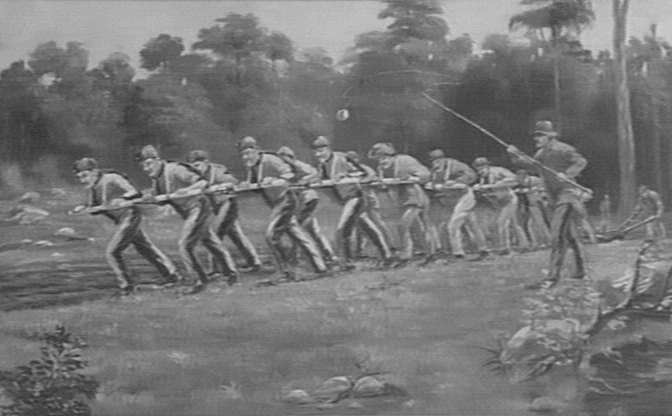 Prisoners on the Justitia faced hard labour there, while awaiting transportation. The prison hulk had been originally launched many years earlier as an East Indiaman named the Admiral Rainier. It had been converted into a gun ship, an gun store ship, then finally, the old hulk was moored at the Woolwich Warren, and used to hold convicts in preparation for their transportation. David was not held in the Justitia for long though. On the 4th October 1837, he boarded the Neptune for transportation to Van Diemen's Land (Tasmania). This was a 644 ton merchant ship built in 1815. According to her Wikipedia entry: "On her first convict voyage, under the command of William Ferris and surgeon Joseph Steret, she departed Sheerness on the 7 October 1837 and arrived in Hobart on 18 January 1838. She transported 200 male convicts, three of whom died en route. So that is where he went! Hobart town in 1841. From the Tasmanian Archive on Flickr. No known copyright restrictions. Did my transported ancestor survive the voyage? Yes he did. 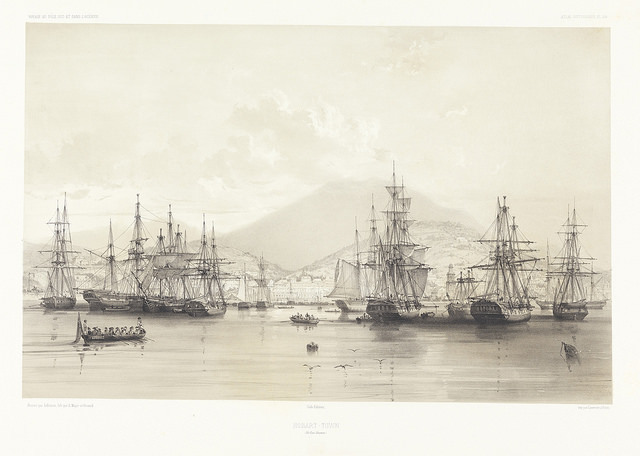 In 1841, he was recorded in the New South Wales and Tasmania, Australia Convict Musters, 1806-1849 list, as police number 1404, a convict from the Neptune, who was employed in service at the Port Arthur Convict Settlement in Tasmania. According to the Wikipedia entry for Port Arthur: "From 1833, until 1853, it was the destination for the hardest of convicted British criminals, those who were secondary offenders having re-offended after their arrival in Australia. Rebellious personalities from other convict stations were also sent here, a quite undesirable punishment. In addition Port Arthur had some of the strictest security measures of the British penal system.". On the 18th July 1851. David, residing at Longford, Northern Tasmania, was issued a conditional discharge. He survived his transportation, forced labour, and life in a harsh convict settlement. Did he manage to return to England? I see no sign of him with Sarah. My guess is that like many, he settled as a free man in Tasmania and died there. I see no record of a ﻿ticket for leave﻿. Meanwhile back in England, his wife Sarah Peach nee Riches, and young daughter Ann Peach, returned to Sarah's family, who had moved from Hockham to the nearby market town of Attleborough in Norfolk. Sarah had to survive and rear their daughter Ann with no husband. She worked hard over the years as a servant, washer woman, and char woman in Attleborough. She gave birth to at least two more children that carried the surname Peach. One she christened as David, giving him his biological father's surname (Wilson) as a middle name. She appears on the records as a hard working, strong, and independent woman. Their daughter Ann went on to meet and wed local Attleborough boy Robert Smith. 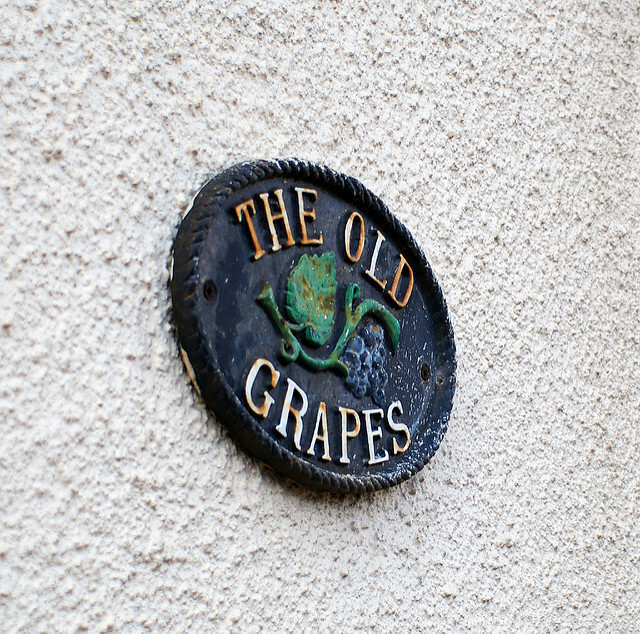 For many years, they jointly ran a beerhouse in Attleborough named the Grapes. 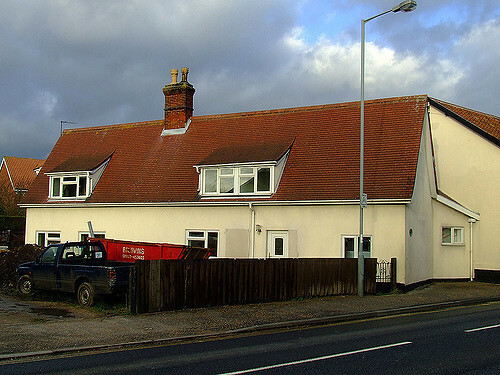 Robert also worked as a bricklayer, and ran a builder supply yard from behind the Attleborough inn. One of their children was Frederick Smith. As a wheelwright, he moved to Norwich. There he met a servant from South Norfolk called Emily Barber. They married, and reared a family. The youngest child was a Doris Emily Winifred Smith. Her father would take her on business to East Dereham, where she met a young Reginald John Brooker. End of this story.